AccountEdge 2009 is the first release of the financial accounting package in several years that offers more than minor tweaks to the back end of the application or cosmetic interface changes to the front end. While the 2007 update ( ) brought revisions to the code base, making AccountEdge a Universal application, and the 2008 version ( ) streamlined the interface, giving users a more unified experience, neither of those updates offered much in the way of new features, tangible change, or increased value to longtime users of the program. AccountEdge 2009 is a powerful application for managing all aspects of your business, and for the first time in years, the program not only offers under-the-hood changes to enhance security and network speed, but also serves up new and useful features for all users. Note that Acclivity, the U.S. distributor of AccountEdge and other MYOB products, purchased the company late last year. However, as a point of reference for now, it still refers to the program's developer as MYOB. It plans to transition away from that name over time. AccountEdge has always done a tremendous job of helping you manage your business’s financial interests by giving you great tools with which to keep track of inventory, collect money, pay bills, pay employees, and assess your company’s financial health. Expanding on that, AccountEdge 2009 now includes a great new feature to help you get a quick overview and an excellent grasp of where your business stands. 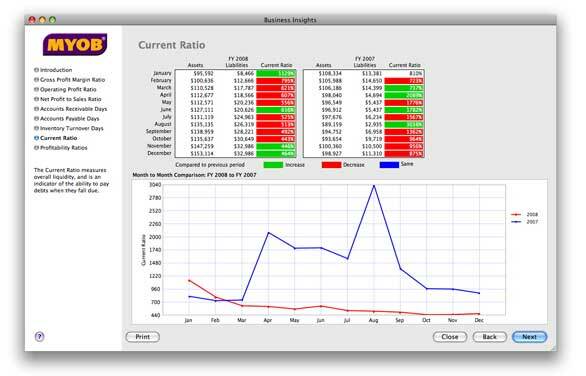 Business Insights, available from the Accounts Center, presents you with eight graphical reports that show you information such as your company’s gross profit margin ratios, operating profit ratios, inventory turnover days, and accounts receivable days. Each of these reports is easy to understand and an excellent resource for seeing how well your business is doing at any given time—and for determining how well it may do in the future. As with the last two versions of AccountEdge, MYOB has put a lot of work into features and functionality that you may not initially notice, especially if you don’t use AccountEdge in a networked, multiuser environment, don’t import data from other sources, don’t use AppleScript, or only use AccountEdge’s most basic security features. MYOB says that it has tweaked the program’s network performance in a number of areas, making the application perform much more quickly. While we weren’t able to test these claims, the company says these enhancements should be obvious to anyone using the program in a networked, multiuser environment. Those users should expect noticeably faster performance when searching lists and when transactions are recorded. Two new AccountEdge features make working with contact information much easier. The first is a new Card File Action Menu that you use when viewing contacts in the program’s card file. Clicking the Action button opens a menu from which you can select from a dozen actions to apply to the selected contact—for instance, you could create a new quote or sale for a customer or pay a bill for a vendor. AccountEdge also has enhanced search tools that make it possible for you to fuzzy search contact and sales information, which means that you can search for a company or person when you know only some, but not all of the search criteria. Unfortunately these enhanced capabilities can’t live search data—filtering down your list as you type more text in the search field— nor is the data searchable from within Spotlight. AccountEdge has always had excellent security features, making it possible—and relatively simple—to limit the access your employees have to sensitive information. MYOB has further enhanced these capabilities, giving you finer control over who can see secure information, such as the personal data you have about your employees. These security features also extend to the program’s newly enhanced AppleScript tools, which allow third-party developers to gather and send information to AccountEdge using AppleScript. The power behind AccountEdge’s AppleScript enhancements can be found in Marketcircle’s $99 MYOB AccountEdge Connect application, which allows you to pull inventory item and contact information into Daylight ( ) and send estimates and contact information created in Daylight back to AccountEdge. I’ve complained quite a bit over the years about AccountEdge’s (and other business accounting programs’) inferior form customization tools. While these features still aren’t perfect, the form tools are significantly improved in AccountEdge 2009. You’ll now be able to personalize invoices, estimates, statements, and checks in a more sophisticated way. The forms customization tool’s two greatest enhancements are its new Format and Fields palettes, which you use to quickly and easily add fields to your form and then change the way they look. AccountEdge’s new Business Insights feature helps you get a quick grasp of the overall financial status of your business. On the Fields palette, every field is organized into a logical grouping: one group for data that you want appear on every page, one for data that should appear only on the last page, and one for data that should appear only in the columns containing individual line items. After using the new Fields palette, for the first time I felt confident that the fields I added to a form would be rendered correctly, a vast improvement over any other MYOB accounting product. Unfortunately, the Format palette is not yet up to speed. While it does make many aspects of customizing forms easier—it’s no longer a hassle to change fonts and sizes, or to adjust text alignment within a text box or form field—it is missing some maddeningly obvious tools that are basic necessities for easy form creation. For example, there are no tools for aligning form fields, text boxes, images, or other objects on the page, so everything needs to be aligned manually. Further, add a background image to a form and you’ll find that you have very limited options for where and how that image can appear; it’s not possible to adjust the image’s opacity, which means you’ll always have to work outside of AccountEdge to make a background image look right. Invoices, estimates, and statements are the public face of your business; unfortunately, MYOB still doesn’t seem to get that. The company needs to look at programs such as Marketcircle’s Billings ( ) to see what a good form looks like and just how far it needs to go to help AccountEdge get there. 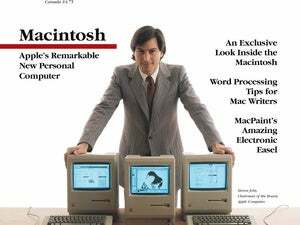 AccountEdge has long been the best and most versatile business accounting package available for the Mac. While I’d still like to see better form customization tools, AccountEdge 2009 offers excellent new features for current users who are looking to upgrade, and a solid foundation for anyone who needs a business accounting app.